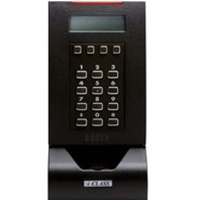 6181: The bioCLASS RWKLB575 provides secure multi-factor authentication utilizing smart card technology combined with biometric template verification, and/or a pin (verified by the smart card or access control system). During verification at the door, the LCD graphical display will assist the user with instructions about finger placement on the biometric sensor. 6250: The bioCLASS card programmer (CP575) complements the reader. The CP575 is connected to your PC via a USB port. The software guides the user to place his/her finger on the sensor. The fingerprint template is collected at the unit and immediately transferred to the card. During this enrollment process, the fingerprint template is stored ONLY on the card; it is never transmitted to an external host. The finger pad at the bottom center of the biometric unit offers ease-of-use for either right or left-handed enrollment. The bioCLASS RWKLB575 read/write contactless smart card reader with keypad, LCD display, and fingerprint biometric verification. HID's offerings encompass the industry's broadest range of open standard contactless smart card products, available from over 40,000 resellers worldwide.